Fried Chicken. In the last couple of years, it has practically become a religion. In nearly every corner of the world, a different rendition has been carefully crafted. From Nashville Hot, to a classic bucket from the Colonel- we, as a society, love our Fried Chicken. 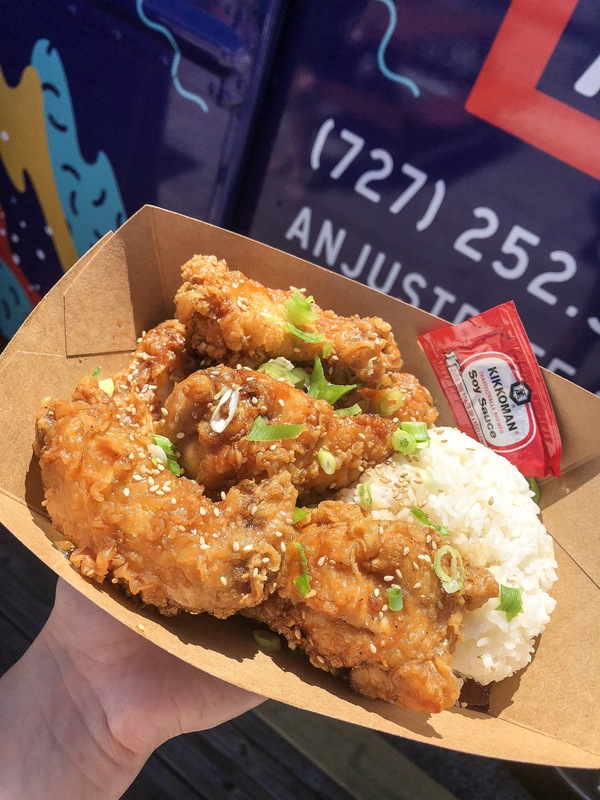 Here in St Pete, Anju Korean Gastrotruck is serving up their highly sought-after Fried Chicken to the masses, and it comes in the form of Korean Fried Chicken (K.F.C.). If you think like I do, you're probably wondering, "what does Anju mean?" 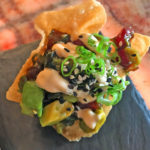 In essence, Anju translates to salty, crispy, snack-like, pub-grub that is meant to be enjoyed with libations (sign me up!). K.F.C. 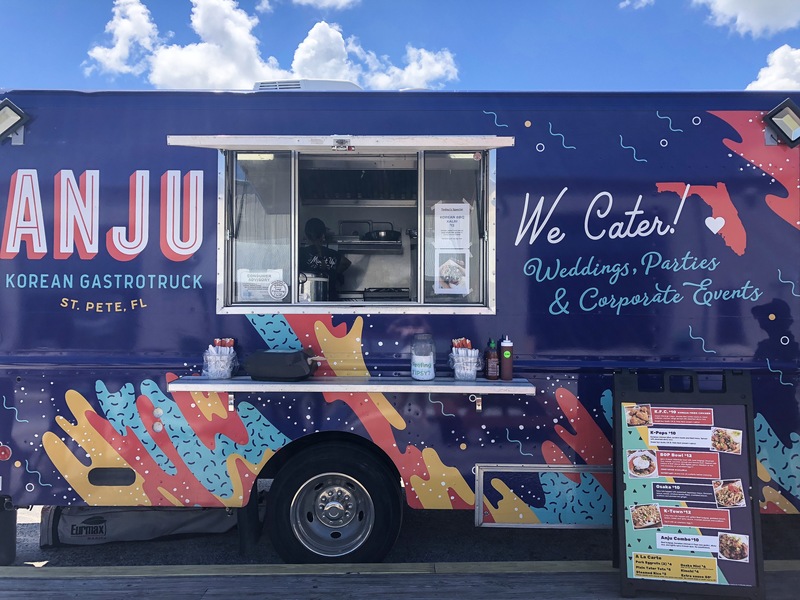 undoubtedly fits the bill, and some would claim that it is the king of Anju, but that isn't the only thing coming hot out of the window of this Gastrotruck. 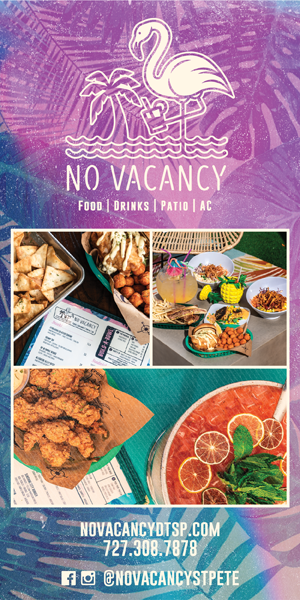 You can expect appearances from additional mouthwatering items, such as; Tots with Bulgogi, Bibimbap Bowls, Pork Egg rolls and Kimchi...just to name a few. 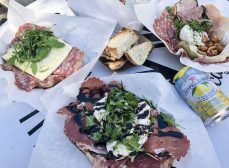 A few years ago, Anju owners Dan and Meeae Wolney moved from Boulder, Colorado to beautiful St Petersburg to embark on their food truck journey. 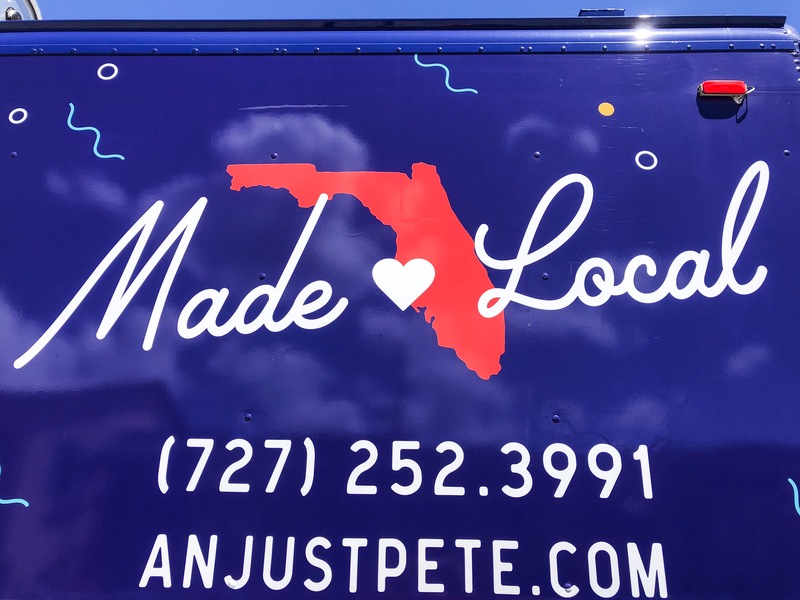 In their eyes, St Pete was the ideal location for a food truck, because it could remain operational year-round. Dan and Meeae have been food-trucking for a total of four years now. For the first 2.5 years, they operated out of a trailer. Today (and for the past year and 3 months), they prepare and serve all of their food from the Anju truck. 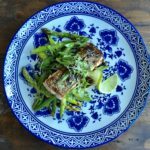 Before heading to the sunshine state, Meeae had attended culinary school in Boulder and then worked in a few fine-dining establishments. In 2015, shortly after the Wolney's began their food truck endeavor, Meeae appeared on the show "Cutthroat Kitchen." 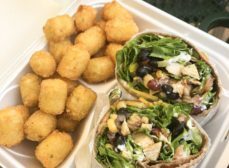 The Tampa Bay Times published a fantastic feature about Meeae's upcoming appearance on the well-known show, which provided tremendous exposure for their food truck. 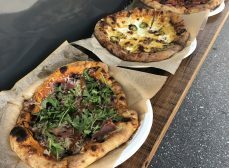 When the Wolney's arrived in St Pete to begin their food truck venture, they had ultimately decided that they wanted to present a genre of food that was uncommon. 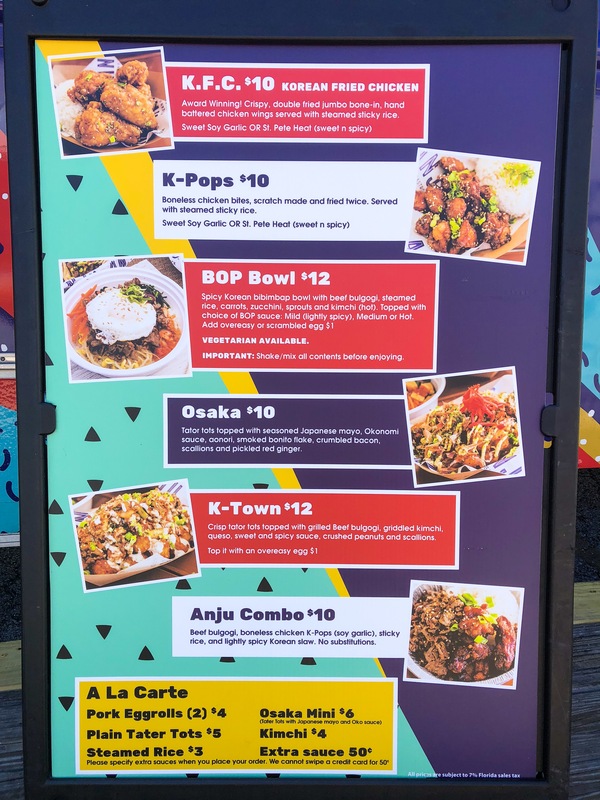 Initially, they only had Bibimbap on their menu, which was completely foreign to a lot of their customers in the Tampa Bay Area. This traditional Korean dish was extremely well received, which created a lot of buzz around the truck. 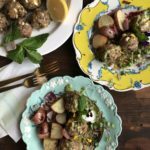 Over time, additional items were added to the menu. While the Bibimbap may not be the most desired offering from Anju today, it still has a well-deserved spot on the menu. So then, what is the fan-favorite from Anju? Drum roll...K-Pops! Boneless, twice-fried chicken bites, in your choice of a Sweet Soy Garlic Sauce, or St Pete Heat, served with rice. Sure, the K-Pops may be ordered with more frequency, but the Korean Fried Chicken (K.F.C.) is where the true gold is. Dan proclaimed that the K.F.C. is their favorite, and with that being said, I obviously had to try it for myself. 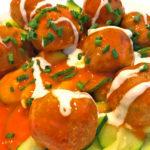 The K.F.C., too, can be made with Sweet Soy Garlic Sauce, or St Pete Heat. Dan noted that the majority of customers opt for Soy Garlic, so, that was my selection. 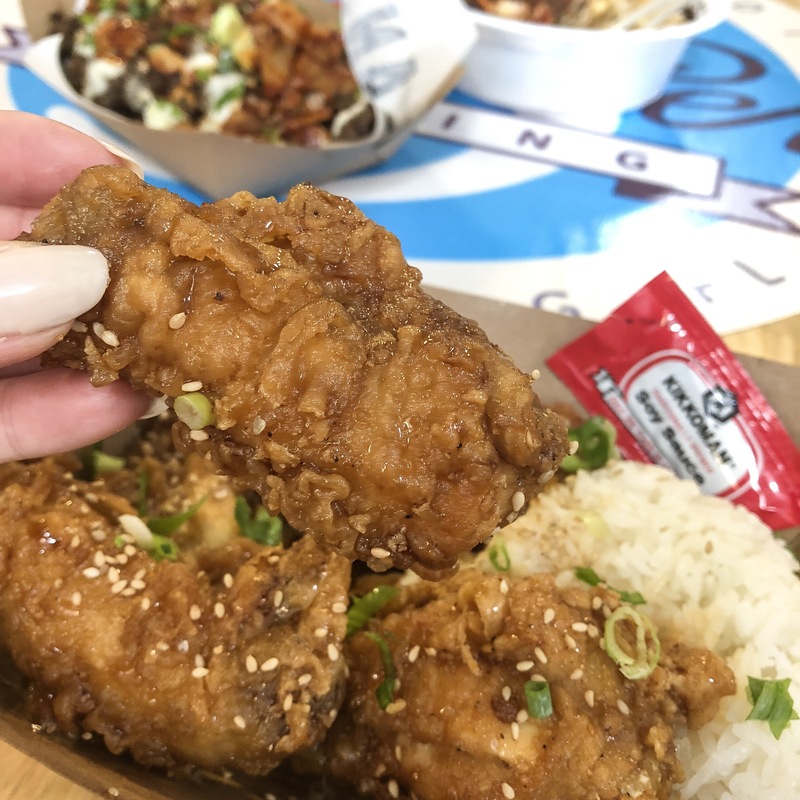 The Korean Fried Chicken is their award-winning dish. 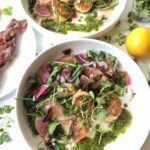 The dish is comprised of a mound of crispy, twice-fried jumbo bone-in, hand-battered Chicken wings, in either Sweet Soy Garlic or St Pete Heat, served with steamed Sticky Rice. 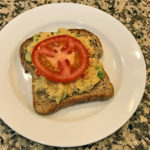 For me, it was love at first bite: crunchy, with tantalizing sweet and savory flavors on the outside, while remaining juicy and succulent on the inside. 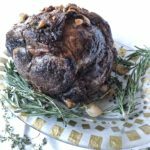 The Wings have an ample amount of meat, which makes this an ideal dish to share between two. One element of the dish that I especially appreciated, was that the Chicken was not drowning in an overabundance of sauce. The soft sticky rice on the side was a light and delightful pairing on the side. 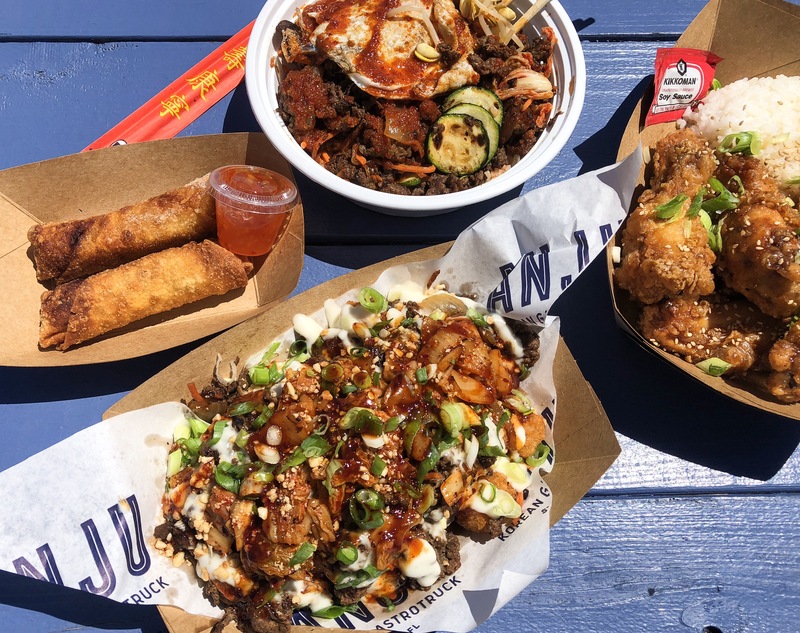 Bottom line is, when you pay a visit to Anju Korean Gastrotruck, an order of the K.F.C. is necessary. Sweet Soy Garlic K.F.C: Double-fried Jumbo Bone-in, hand battered Chicken Wings served with Sticky Rice. As previously mentioned, the Bibimbap is what started it all for Anju. 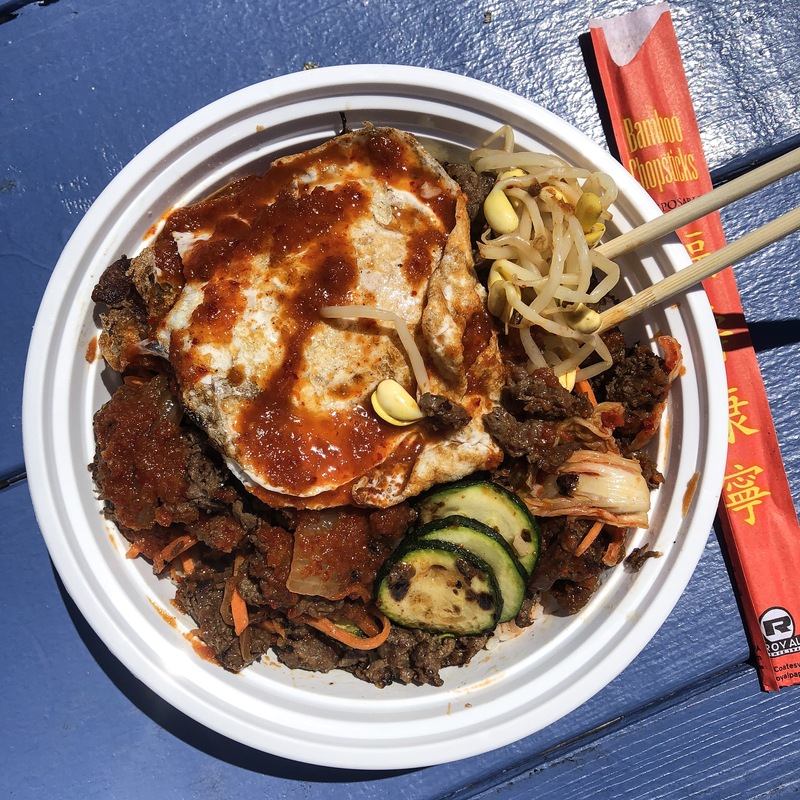 The Bop Bowl, as it is called, is a traditional Korean dish with Beef Bulgogi, steamed Rice, Carrots, Zucchini, Sprouts, spicy Kimchi, choice of Mild, Medium or Hot Bop Sauce, and for $1.00 extra, you can add an egg. For my Bop Bowl, I chose Mild Bop Sauce and added an Over Easy Egg, for good measure. One thing to note when you receive your order of Bibimbap: mix it up, and then mix it up again! 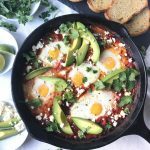 Each layer of the bowl contains a different ingredient and flavor element that, when combined together, makes for one impeccable consolidation of ingredients. The Bulgogi is cooked and seasoned to sheer perfection (and there is plenty of it! ), Kimchi, along with the Carrots and Zucchini provide crisp zing, and the addition of Egg adds luscious character. If you are not big on heat, the Mild Bop Sauce is for you- a hint of spice is present, but it does not overwhelm the taste buds. Normally, I'm a French Fry kind of gal, but the Tator Tot offerings from Anju have me whistling a different tune. There are two Tot options available on the menu: Osaka and K Town. 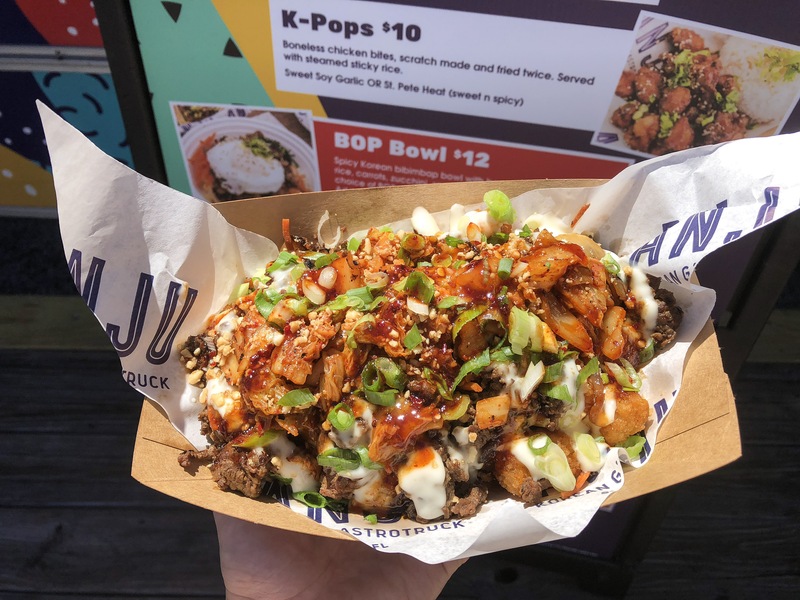 My stomach lead me towards K Town, which has Crisp Tator Tots topped with grilled Beef Bulgogi, griddled Kimchi, Queso, Sweet and Spicy Sauce, crushed Peanuts and Scallions. 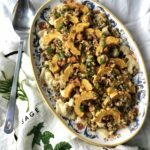 The Tots are piled high and loaded with toppings galore- this dish is unquestionably enough to be considered a main meal for one, or could easily feed two to three on the side. Even with a plethora of enticing accompaniments on top, the Tots still remained nice and crispy with each and every bite. These babies will have you licking the plate when you're through. For the most part, Anju keeps their menu relatively the same, with pop up additions here and there. 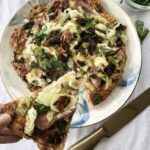 Where can you catch up with Anju? They try to spend the majority of their time in St. Pete., but they also travel to Tampa and other areas within close proximity. You can find their weekly schedule posted on their Instagram and Facebook pages at the beginning of each week. Additionally, they cater! Make certain to contact them for your next event. 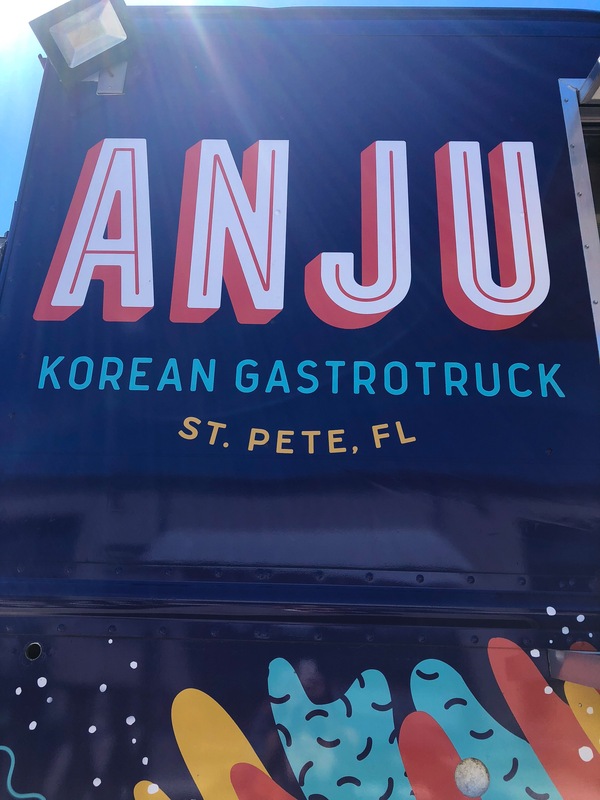 Anju Korean Gastrotruck is a mobile kitchen in St. Petersburg, FL. 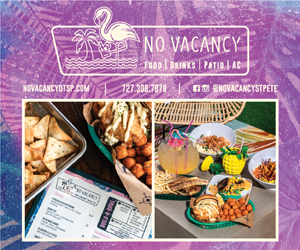 Catering and serving Korean fried chicken, along with other tasty favorites . 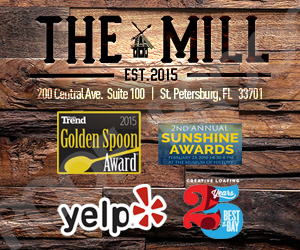 I’m not from St. Pete but I visit often and I definitely will check this place out the next time we’re in town, thanks for the heads up on this!